Local TV channel America reported Garcia was in a coma and broadcast images of Garcia’s son, supporters and legislators entering the hospital, where police in riot gear stood by. 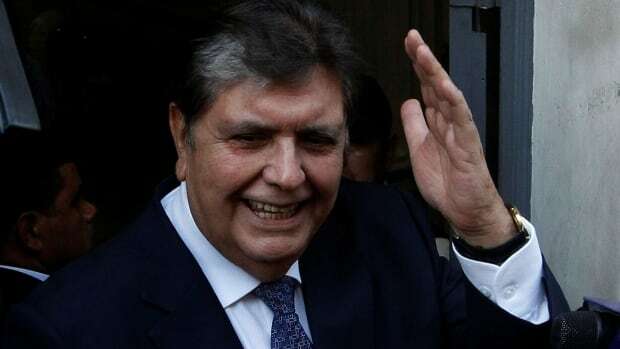 Corruption cases have reached the highest levels in Peru politics, most notably involving officials and Odebrecht, the Brazilian construction giant that has admitted to spreading some $800 million US in bribes to officials across Latin America, including $29 million in Peru. Martin Vizcarra, who had been serving as Peru’s ambassador to Canada, succeeded Kuczynski. Odebrecht’s Peruvian unit formalized an agreement in February with authorities to pay a multimillion dollar fine to allow it to continue operating in the country in return for providing evidence about officials it bribed. Odebrecht has also been tied to corruption probes involving officials in Brazil, Ecuador, Panama, Chile and Mexico.